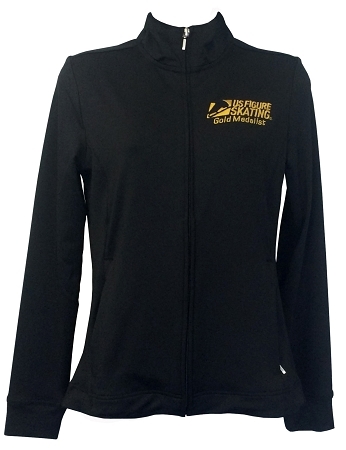 92% polyester / 8% spandex knit fabric made exclusively with TopShield™ moisture management treatment. This hi-tech treatment applied to the fabric wicks moisture away from your body, keeping you comfortable and dry. Princess seams for a slimming silhouette. Self fabric collar & cuffs, plus a tagless neck label for comfort. ALL SALES ARE FINAL. BECAUSE OF THE CUSTOMIZATION, NO REFUNDS WILL BE ALLOWED ON THIS PRODUCT. Awesome jacket! 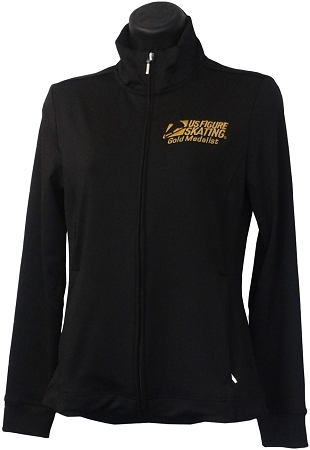 Fits well, looks very polished, and keeps me warm during practice. For reference, I am 5'3 and the small fits perfectly. I love my jacket. The Med fits me well and is my usual size. My friends who bought one years ago have issues with the sleeves to long and not fitted. The new jackets have a comfortable cuff. The jacket was of very high quality. The embroidery was nicely done. Excellent fit. My daughter couldn't have been happier. Love this jacket. Material is so soft and light, perfect for warmups before my sessions. Embroidery is high quality. Size is true to size. I would recommend this jacket to anyone who wants a beautiful warmup jacket. My daughter loves the jacket and it fits perfectly. For reference she is 5"3" and wears the small size. It looks really nice on. The jacket is excellent quality and the embroidery was done perfectly. Great jacket! 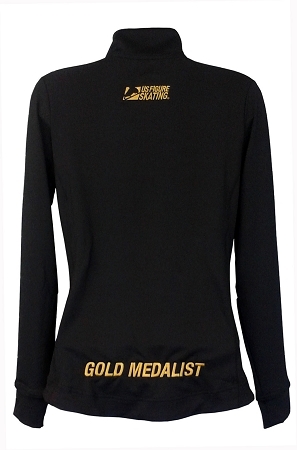 I am a very happy skater to have received it!